I first saw this book featured by Cleo on her blog, Cleopatra Loves Books. She's an avid reader and reviewer, and I find the best mystery, crime, and suspense novels in Cleo's posts. Thus it's no surprise that I'm totally enthralled by The Crooked House. which is a very atmospheric mystery set primarily in an English village on the marshes. 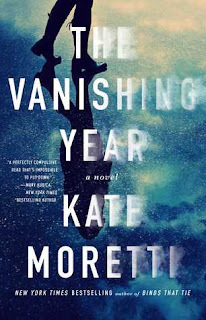 The Vanishing Year features a troubled protagonist, now known as New York society wife Zoe Whittaker. She is on the run from the dangers of her past and fears that her rich, distant husband will learn her darkest secrets. Henry Whittaker has given Zoe a life she never dreamed possible, but is he the charming knight in armor she initially imagined him to be? Changes in his behavior toward Zoe and his secretive nature unsettle her at an extremely vulnerable time. Why is Henry so reluctant to share information about his own past, and what is he hiding? This fast-paced suspenseful thriller is a satisfying read that twists and turns its way to an unexpected conclusion. 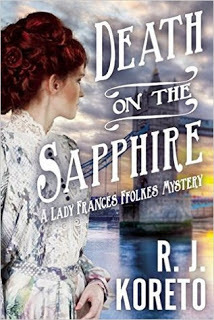 Set in Edwardian London, Death on the Sapphire is the first book in the Lady Frances Ffolkes mystery series. Unwilling to settle for the traditional female roles of the time, Lady Frances is a suffragist and advocate for the poor who is determined to make her own way in society. Her intelligence and curiosity lead her to investigate the death of a family friend believed to have committed suicide and the disappearance of his tell-all manuscript. Her keen powers of observation and deduction put her in harm's way as she unravels the truth of this and other deaths of military men who served during the Boer War. Aided by her loyal lady's maid, Franny encounters danger--and romance--along the way. This historical series is off to a fascinating start, and I am eager for the next installment. 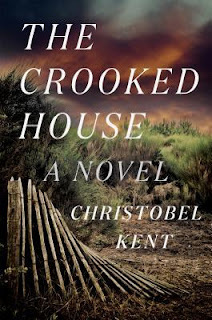 I'm actually 124 pages into this much anticipated novel (more from Goodreads), but admit to being distracted by sampling The Crooked House, which quickly became my current read due to its un-put-down-ability. 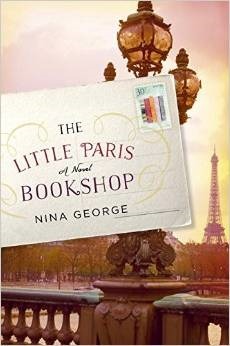 So, I will be picking up The Little Paris Bookshop next so that I have it finished in time for a book club meeting at the end of the week. I'm waiting for . . .
After recently reading and enjoying Death on the Sapphire, I was delighted to learn that it won't be too long of a wait before the second book in the series is published. 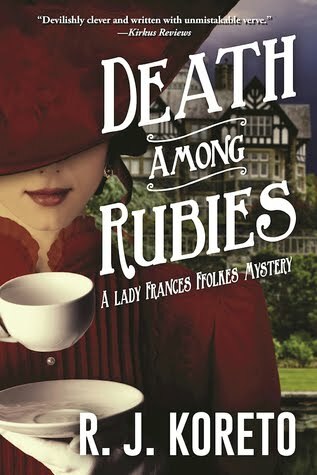 From barnesandnoble.com: Lady Frances Ffolkes is incensed when she finds out that her dear friends Gwendolyn and Thomasina have been subject to vicious threats. Promising to uncover their attacker, she travels with them to Kestrel's Eyrie, the fabled estate belonging to Gwen's family. But soon Frances faces an even greater problem, when Gwen’s father, a powerful diplomat, is stabbed to death with his prized ruby dagger. Frances, with her loyal maid June Mallow at her side, jumps right into interrogating the estate's numbered guests: a charming Turkish diplomat with a habit of sneaking off into the night, a brash American heiress with lofty dreams of becoming mistress of the Eyrie, two gossiping widows with their own scandalous secrets, and Gwen's own aunt tasked with keeping the affairs of the estate in order among the chaos of the investigation. But as the case unfolds, Frances's righteous conviction might just be the very thing that leads danger--and even more death--to her own doorstep. 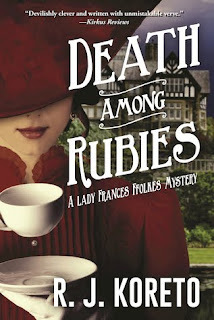 Old sins do indeed cast long shadows in Death Among Rubies a delightful closed-room mystery in the vein of Agatha Christie and the second in R.J. Koreto's effortlessly charming historical series.